As the analog shutdown approaches, the reality of over-the-air DTV reception emerges at both the Management Level, as well as within the Technical Staffs of many CATV systems. The "switch-over" is no trivial matter. Biro Engineering’s Computer Aided DTV Reception Study can prevent costly mistakes and help pave the way to a smoother, speedier completion of the DTV transition. The study starts with two computer runs. The first one lists all analog and DTV stations within a 100 mile radius. The second contains exclusively the DTV stations. The computer calculated distances and directions have an accuracy of 0.01 mile and 0.1 degree respectively. 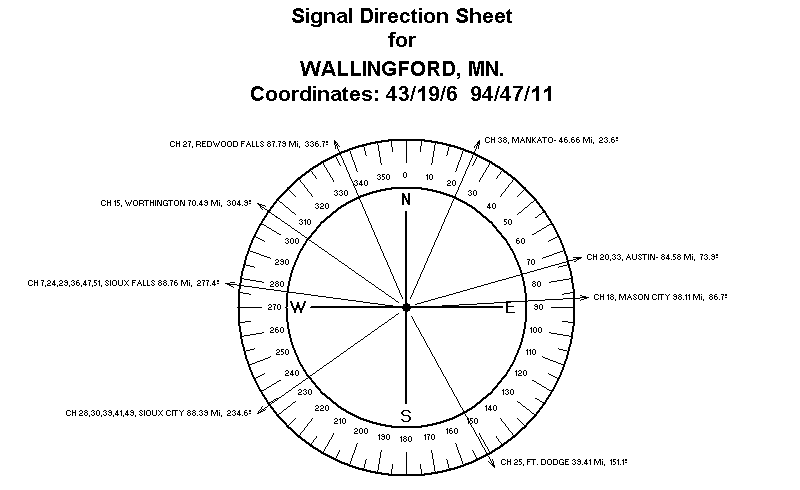 The projected signal levels have taken into consideration the great circle distances to the transmitter, output power of the station, and the transmit antenna height above average terrain, assuming omnidirectional transmit antenna radiation patterns, flat terrain, average ground conductivity and fair weather conditions. However, the predicted signal levels represent only guidelines for the CATV engineer. Significant deviations will occur due to hilly terrain, variation in ground conductivity, dense vegetation, and last but not least, signal levels can be affected by snow and ice deposited on the receiving antenna. Only an on-site signal survey can verify actual signal levels. 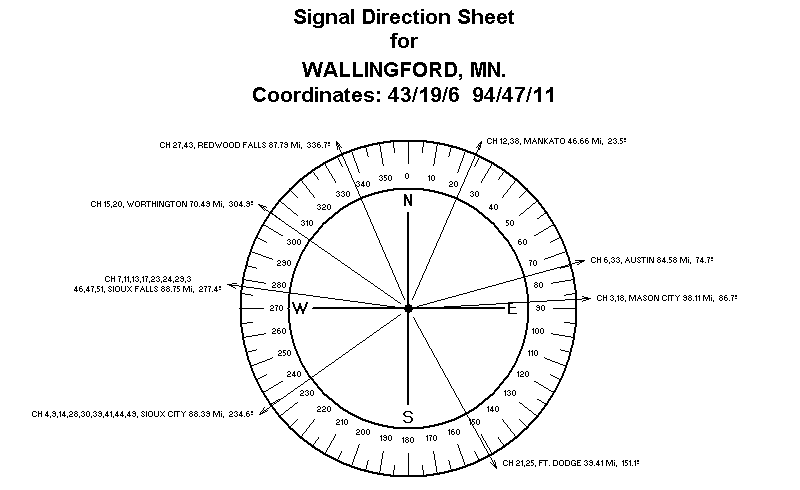 At first blush, the Signal Direction Sheet might seem to contain no new technical information, but it confirms the reception of many DTV/Analog stations from the same direction, which is a tremendous help in operating the rotor-mounted search antenna during the signal survey or assisting the tower crew in the final orientation of the tower-mounted antenna-arrays. When warranted, Special Signal Direction Sheets can be prepared to warn about possible co-channel and adjacent channel interference problems, to be verified by on-site tests and measurements. The last section of the study lists the expected channel movements of certain stations on or after February 17, 2009. This allocation information may affect the antenna-array design of your tower. Antennas should be ordered for these anticipated changes as well. Computer aided studies cannot detect or project interference, generated by high-voltage transmission lines, power-line transformers, mobile radio services, vehicular and airplane-traffic, CB radios, second harmonics of FM stations, and last but not least ghosting. Costly mistakes can be avoided by verifying the projected signal levels and possible interference conditions at your tower site. Biro Engineering offers cost-effective on-site signal verfication surveys, providing factual signal level and picture quality information of the desired channels, as well as co-channel, electrical, RF interference and ghosting identification. As of February 17, 2009 the following digital affiliates will move their operations to a different channel. The fact that the above listed channel movements may not occur the morning of February 17, 2009, is not a fortunate situation, but one with which have to live. The only conclusion that can be reached is to make all necessary and practical preparations for the DTV transition by employing not only theoretical studies using the latest data from the FCC, but on-site surveys ascertaining real-time conditions.